Abstraction and Theme, Part 1 - What's in a theme? To tell a story or not to tell a story? That is the question the SnakesCast asks this week as we discuss theme in games. Today we begin by asking what theme means, what its purpose is, and who may or may not like it. To tell a story or not to tell a story? 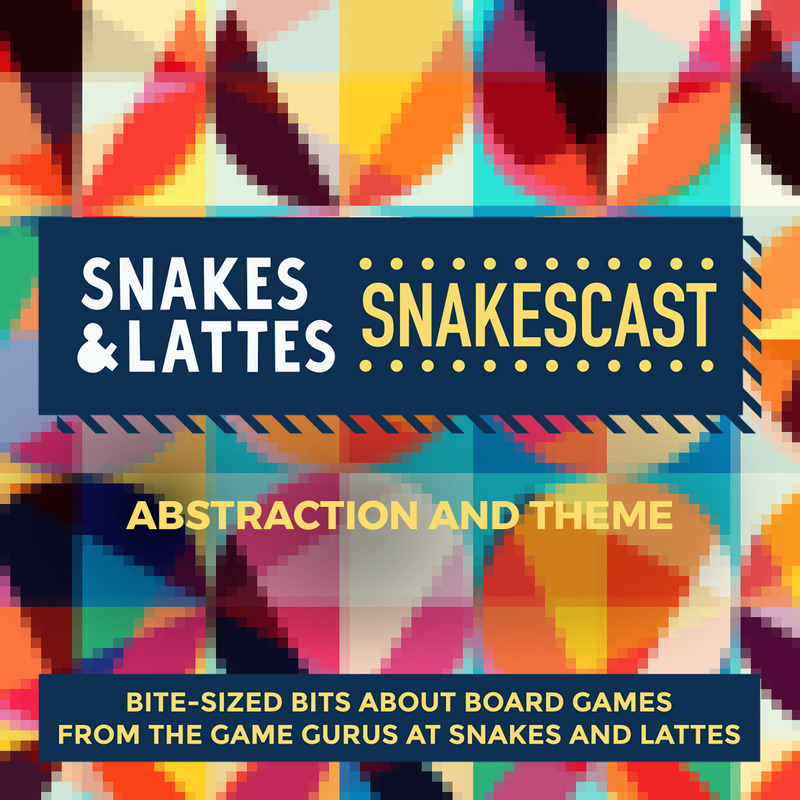 That is the question the SnakesCast asks this week as we delve into the concept of theme vs. abstraction in games - or in other words, whether a game has a narrative hook or not. Today, Monday December 11th 2017, we begin by trying to define theme as it relates to games, we ask what its purpose is, and we talk about how it may be viewed by different kinds of player. To tell a story or not to tell a story? That is the question the SnakesCast asks this week as we discuss theme in games. We continue the discussion with some examples of excellent theme use in games. To tell a story or not to tell a story? 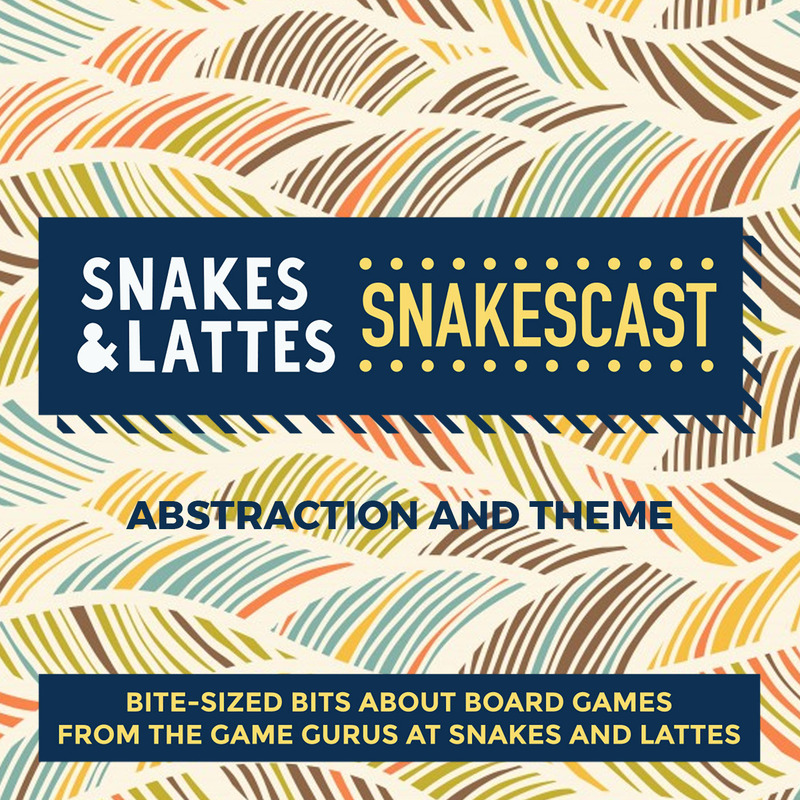 That is the question the SnakesCast asks this week as we delve into the concept of theme vs. abstraction in games - or in other words, whether a game has a narrative hook or not. Today, Wednesday December 13th 2017, we continue by discussing some games that we feel use theme entirely to their benefit. To tell a story or not to tell a story? That is the question the SnakesCast asks this week as we discuss theme in games. We end up by discussing some games that do not use theme well, or have a theme that means nothing to the mechanisms. To tell a story or not to tell a story? 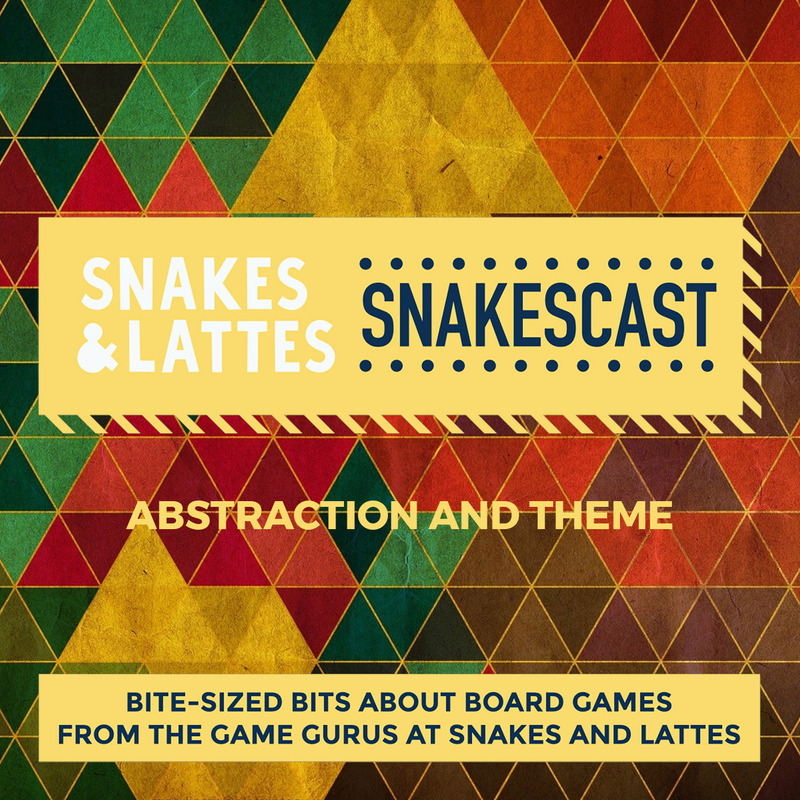 That is the question the SnakesCast asks this week as we delve into the concept of theme vs. abstraction in games - or in other words, whether a game has a narrative hook or not. Today, Friday December 15th 2017, we end the week by talking about games that do not carry theme off so well, or have a "pasted on" theme, which does not serve the mechanisms or the theme itself. Prepare to survive on a cursed island, which may or may not be deserted, as we look at Robinson Crusoe. We start by discussing the scenarios in the game, and offer an idea of the experience. Prepare to survive on a cursed island, which may or may not be deserted, as we look at the cooperative game Robinson Crusoe - Adventures on the Cursed Island. Today, Monday December 4th 2017, we begin by discussing the experience of playing the game, as well as looking at the scenario-based nature of the game that comes in the box. Prepare to survive on a cursed island, which may or may not be deserted, as we look at Robinson Crusoe. Today we discuss the complexities and challenges that the game throws at you as you play it. Prepare to survive on a cursed island, which may or may not be deserted, as we look at the cooperative game Robinson Crusoe - Adventures on the Cursed Island. Today, Wednesday December 6th 2017, we look at the complexities and the challenges in the game, including the scenario challenges and the game's determination and morale system. Prepare to survive on a cursed island, which may or may not be deserted, as we look at Robinson Crusoe. We finish by discussing some of the things we it does or does not do well, and also where the game progressed to. Prepare to survive on a cursed island, which may or may not be deserted, as we look at the cooperative game Robinson Crusoe - Adventures on the Cursed Island. Today, Friday December 8th 2017, we discuss the things that we do feel the game does well and also the things we think it does not do quite so well, in terms of representation in particular. We also briefly discuss the games that have followed it. The Holiday Season is almost upon us, and the air is chilling (if you're in the northern hemisphere!). We offer some gift suggestions this week, beginning with the heavier end of gaming, for those who might know a gamer, but don't know the hobby as well. The Holiday Season is almost upon us, and the air is chilling (if you're in the northern hemisphere, at least!). 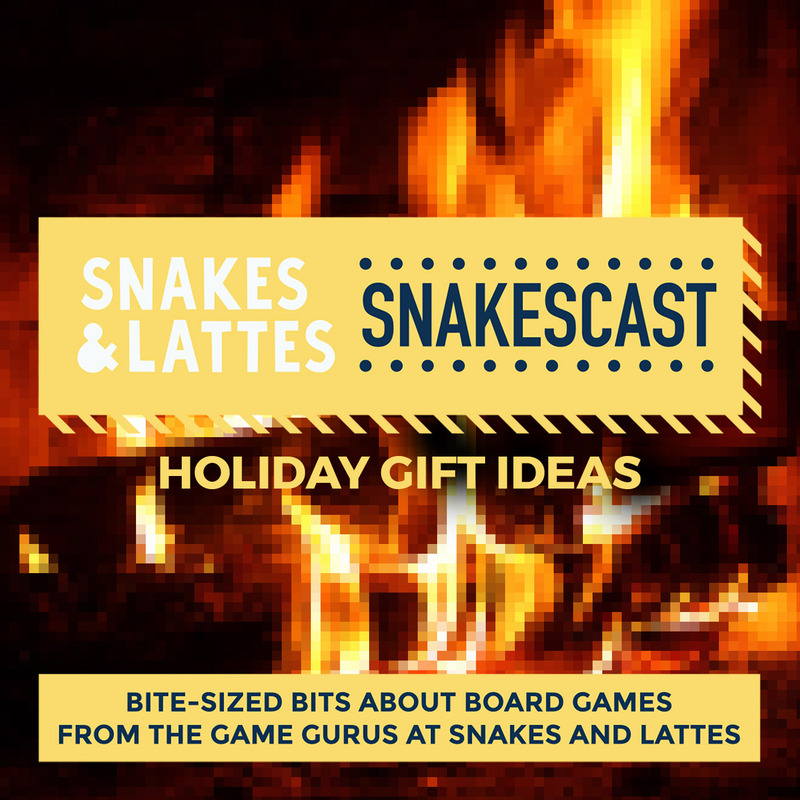 We offer some gift suggestions this week, to help you decide what to get the board gamers in your life. Today, Monday November 27th 2017, we reverse our usual order and begin with the heavier end of gaming, looking at some recent titles to help those who might know a serious gamer, but don't know the hobby as well. The Holiday Season is almost upon us, and the air is chilling (if you're in the northern hemisphere!). We offer some gift suggestions this week, continuing with accessible strategy games for the family. The Holiday Season is almost upon us, and the air is chilling (if you're in the northern hemisphere, at least!). 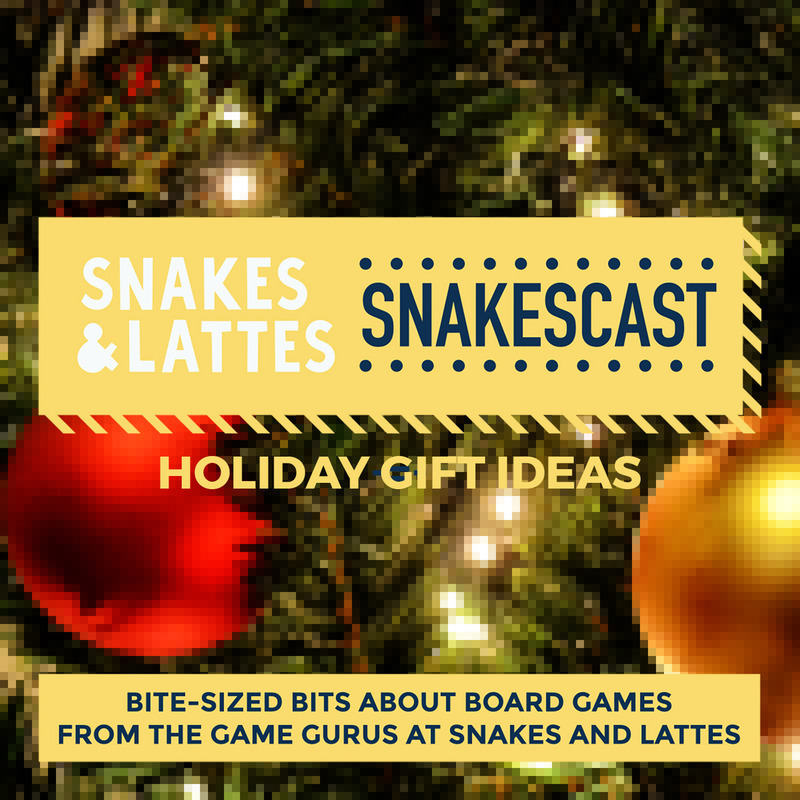 We offer some gift suggestions this week, to help you decide what to get the board gamers in your life. Wednesday November 29th 2017, we continue by discussing accessible strategy games, sometimes called family strategy games, which are also games we find to be excellent for the café environment. The Holiday Season is almost upon us, and the air is chilling (if you're in the northern hemisphere!). We offer some gift suggestions this week, and we finish up with those gifting staples: party games and stocking stuffers. The Holiday Season is almost upon us, and the air is chilling (if you're in the northern hemisphere, at least!). 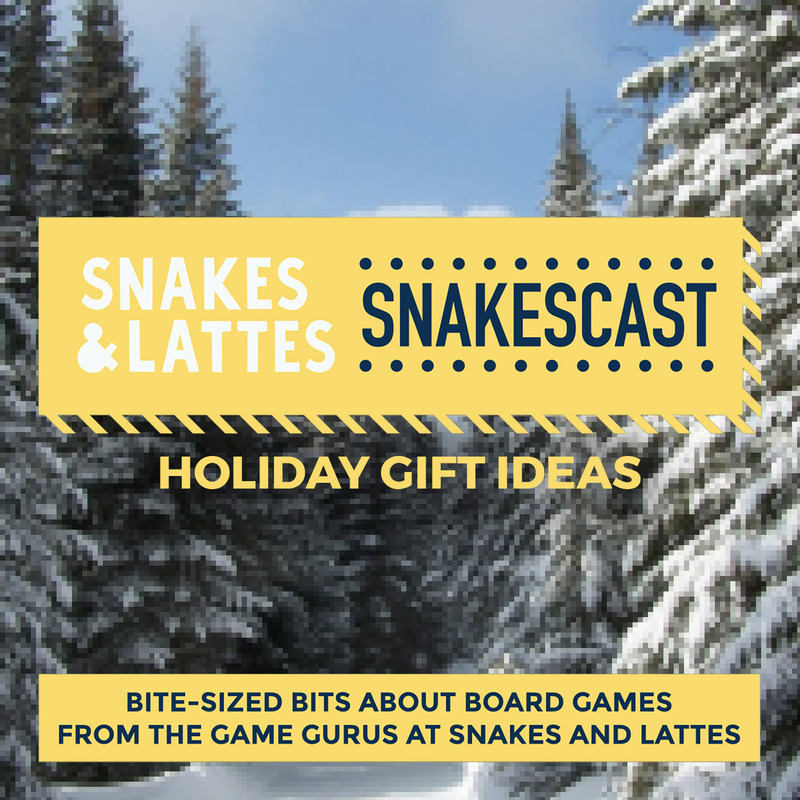 We offer some gift suggestions this week, to help you decide what to get the board gamers in your life. Today, Friday December 1st 2017, we finish up with the gifting staples that are party games and stocking stuffers - discussing both new games and a few classics. We look at stories that continue from game to game this week, examining games with campaigns. We start by asking how campaigns work in board games, give a couple of examples, and ask who they're for. We look at stories that continue from game to game this week, examining games with campaigns. This time we're not tearing anything up. Today, Monday November 20th 2017, we start by asking how campaigns can be implemented in board games, give a couple of examples that have excited us, and ask who would like these games and why they're not so great for a gaming café. We look at stories that continue from game to game this week, examining games with campaigns. Today we delve into Descent: Journeys in the Dark in detail, discuss attachments to characters, and what license these games give you to be creative. We look at stories that continue from game to game this week, examining games with campaigns. This time we're not tearing anything up. Today, Wednesday November 22nd 2017, we look in detail at Descent: Journeys in the Dark (2nd Edition), as well as examining what it is like to become attached to a character, and discussing the license these games give you to create your own stories around their narrative. Campaign Games, Part 3 - Campaigns for everyone! We look at stories that continue from game to game this week, examining games with campaigns. We end this week talking about some more great campaigns, a little more about attachments to characters, and the balance of the players. We look at stories that continue from game to game this week, examining games with campaigns. This time we're not tearing anything up. Today, Friday November 24th 2017, we look at a couple more excellent campaign games, and we also continue the discussion on character investiture, and talk about the necessary balance of player personalities at the game table. Solitaire Games, Part 1 - What do you mean you can play board games by yourself? 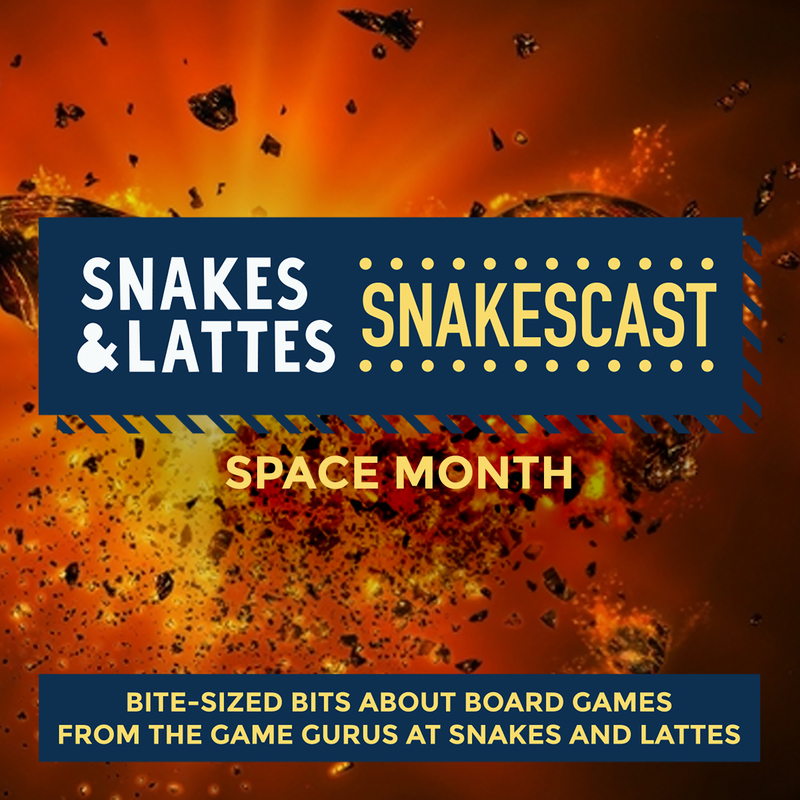 If you're on your own, you can still enjoy board gaming, and the SnakesCast discusses solitaire games this week. We begin by asking why you would play games by yourself. On your own? Waiting for friends, or for another game to finish? 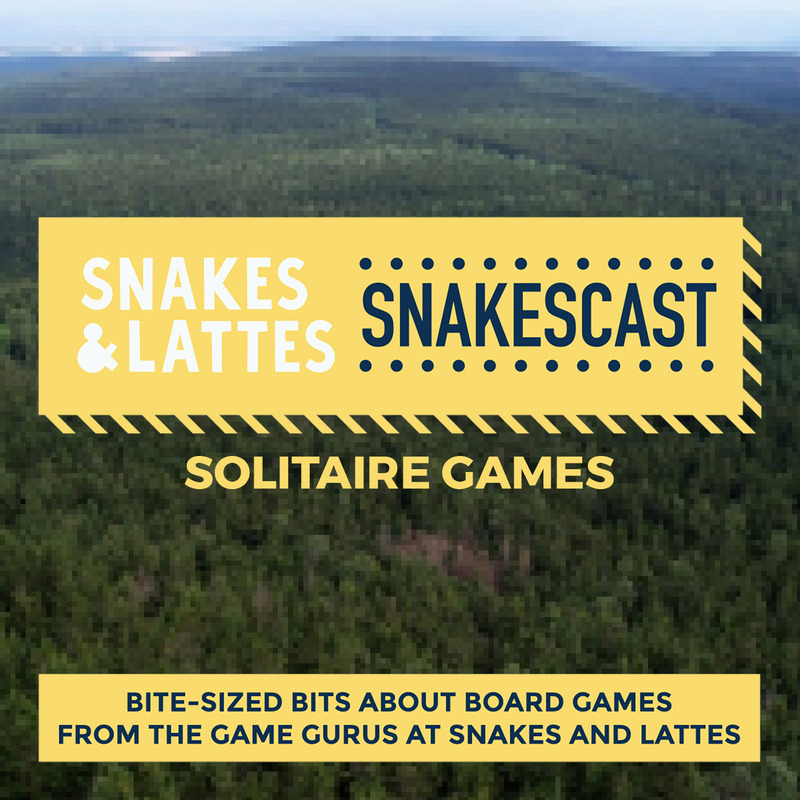 You can still enjoy board gaming, as the SnakesCast examines this week as we discuss solitaire games. Today, Monday November 13th 2017, we begin by asking why you might play games by yourself, and what kinds of game there are for a single player. If you're on your own, you can still enjoy board gaming, and the SnakesCast discusses solitaire games this week. Today we discuss some great solitaire games, and talk about mechanisms surrounding them. On your own? Waiting for friends, or for another game to finish? 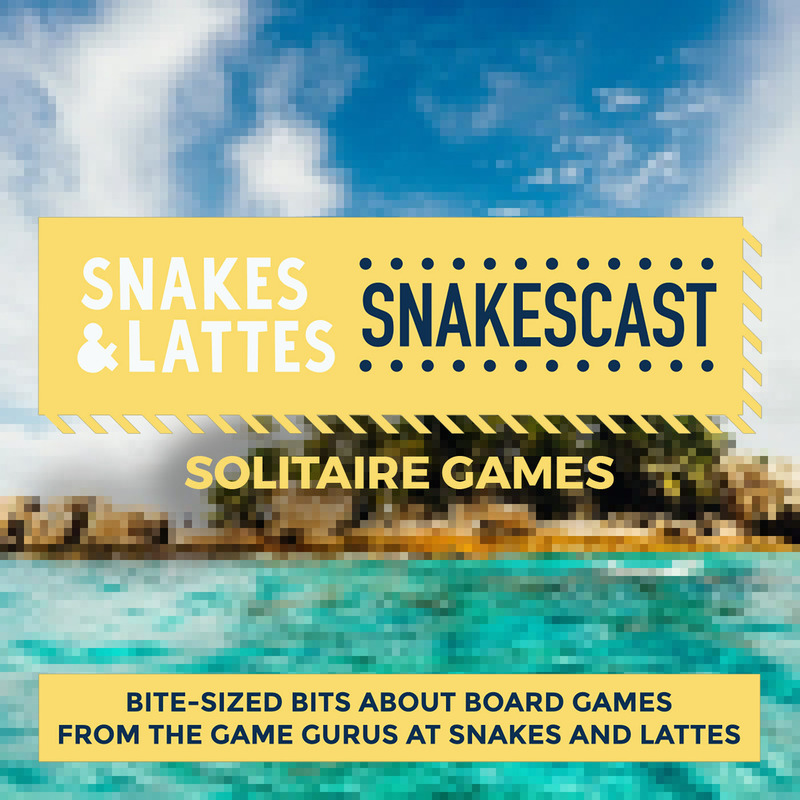 You can still enjoy board gaming, as the SnakesCast examines this week as we discuss solitaire games. Today, Wednesday November 15th 2017, we continue by talking about some great games with one-player options. We also discuss the importance of win and loss states, and how solitaire play compares to video gaming. 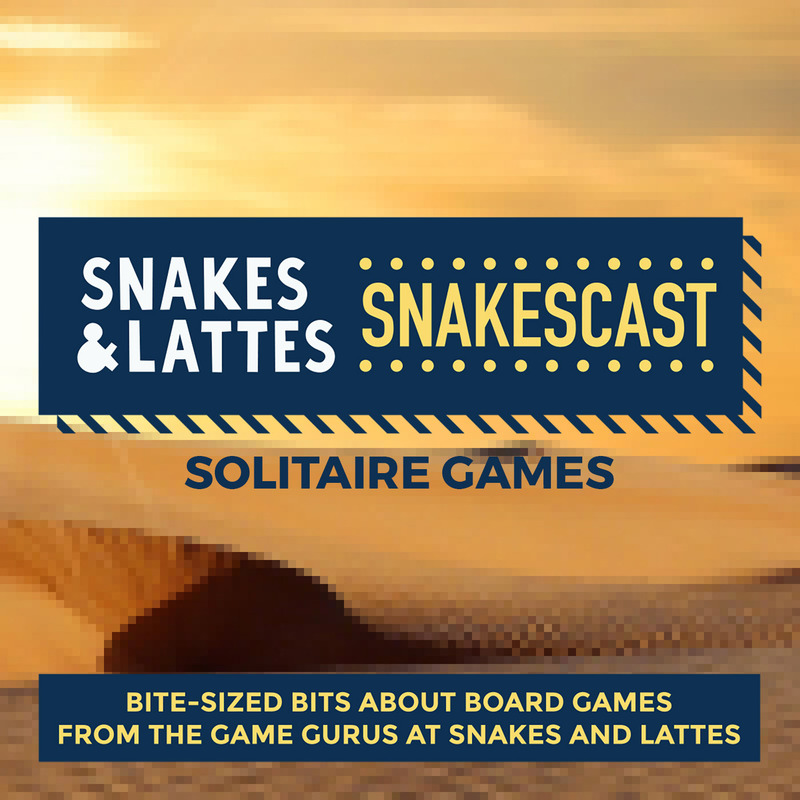 If you're on your own, you can still enjoy board gaming, and the SnakesCast discusses solitaire games this week. This episode's discussion is more about the culture and perception of solitaire gaming, as we dig a little deeper. On your own? Waiting for friends, or for another game to finish? 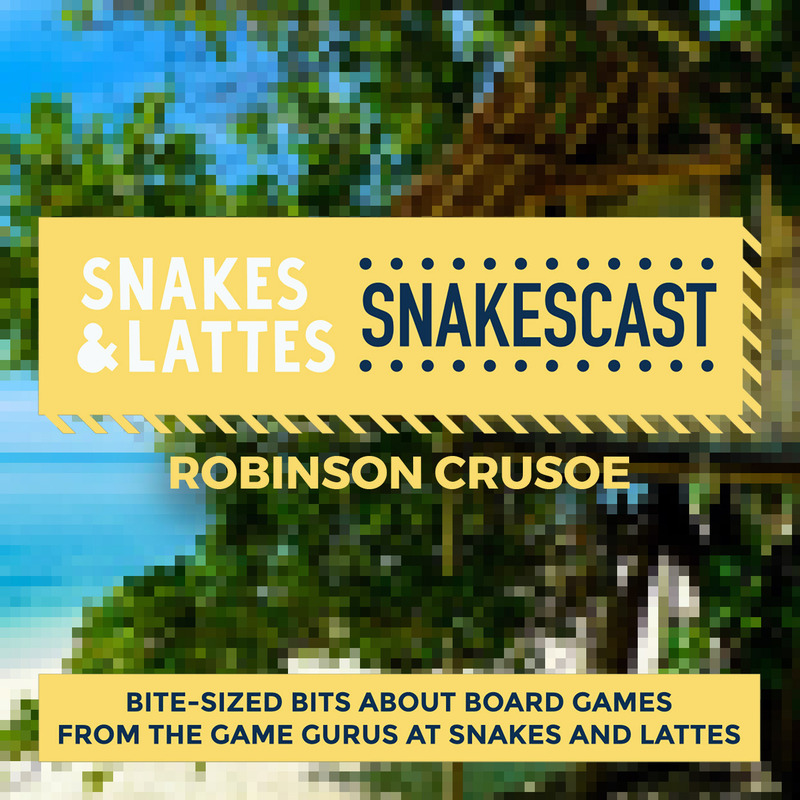 You can still enjoy board gaming, as the SnakesCast examines this week as we discuss solitaire games. Today, Friday November 17th 2018, we look at the culture and perception of solitaire gaming, as well as discussing why some people might like it, and some might not, and why video games might be preferable for many. This week we're tearing things up - literally - as we turn our focus to Legacy games! We begin by talking about the first of this new breed of game: Risk Legacy. This week on the SnakesCast, we're tearing things up. Literally. We're physically destroying game components... and writing on the board in permanent marker... but we were told to! We are turning our focus to games featuring the new Legacy mechanism. Today, Monday November 6th 2017, we begin by looking at the first game to feature the Legacy system: Risk Legacy. This week we're tearing things up - literally - as we turn our focus to Legacy games! Today we talk about the game that took the idea and ran with it: Pandemic Legacy. This week we're tearing things up - literally - as we turn our focus to Legacy games! We finish by discussing the other new Legacy games, and non-Legacy games that may offer a taster of the style. This week on the SnakesCast, we're tearing things up. Literally. We're physically destroying game components... and writing on the board in permanent marker... but we were told to! We are turning our focus to games featuring the new Legacy mechanism. Today, Friday November 10th 2017, we finish up by talking about the other Legacy games that are available. We also discuss games that are similar, and whether they can provide a taster of the Legacy idea. Fear in games, Part 1 - How do games try to create fear? The fear takes hold this week, as Halloween is upon us. 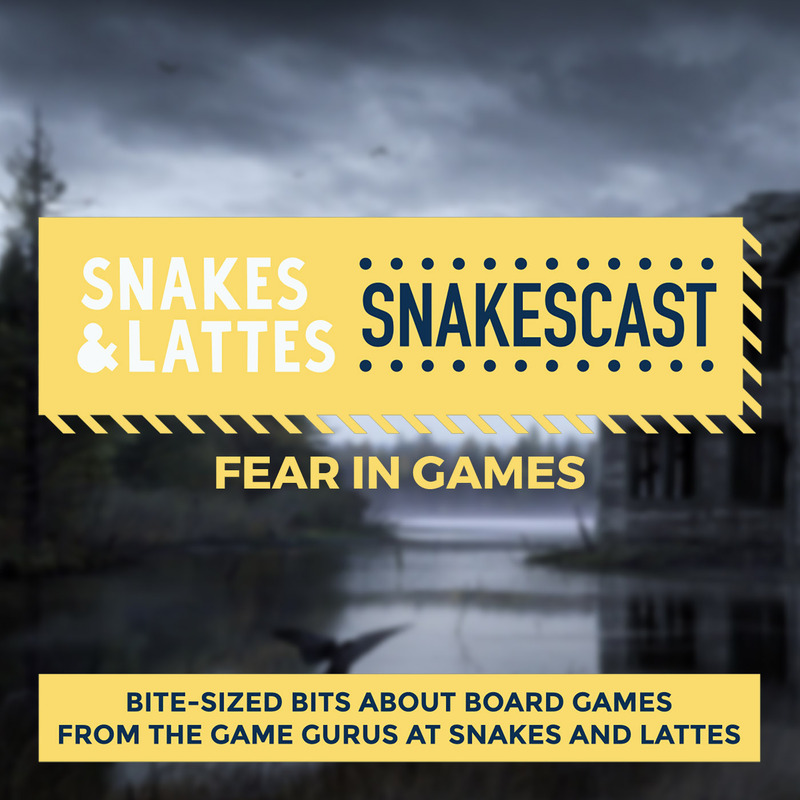 What better week to discuss fear in board games? We begin by asking how games try to create fear, and discuss some examples. Keep the lights on and the curtains closed as the fear takes hold this week. It's Halloween - so what better week to discuss fear in board games? Today, Monday October 30th 2017, we begin by asking how different games attempt to create a sense of fear through theme or mechanisms. The fear takes hold this week, as Halloween is upon us. 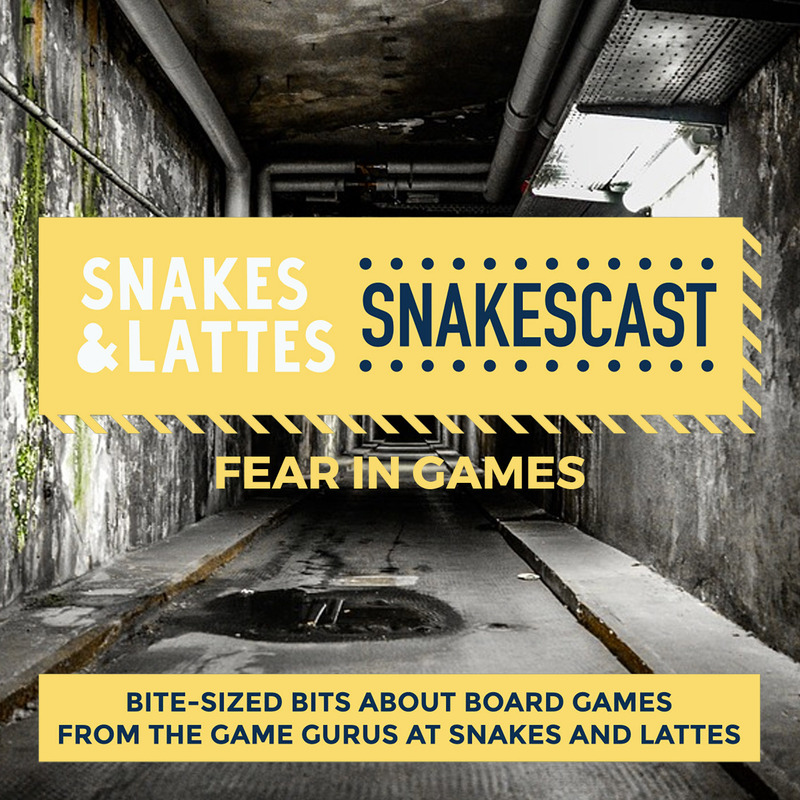 What better week to discuss fear in board games? Today the discussion turns to cooperative games, and how they often make a whole group feel fear. Keep the lights on and the curtains closed as the fear takes hold this week. It's Halloween - so what better week to discuss fear in board games? Today, Wednesday November 1st 2017, the discussion turns to how cooperative games often allow for a large group of people to feel fear as the game fights back. Fear in games, Part 3 - What really makes a scary game? The fear takes hold this week, as Halloween is upon us. 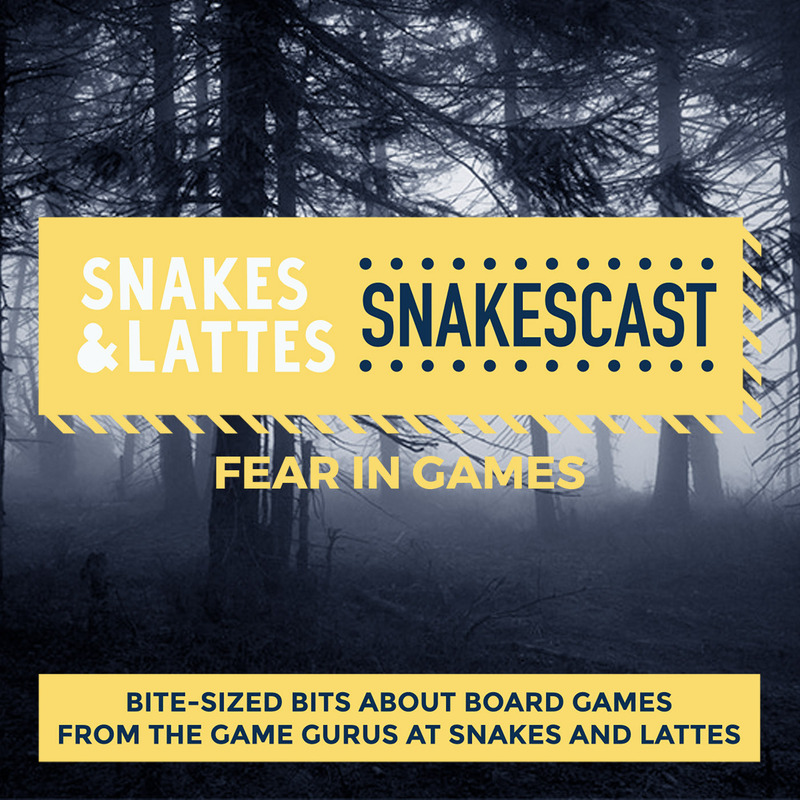 What better week to discuss fear in board games? We face our fears today, and talk about what makes a scary game, both in general and for us. Keep the lights on and the curtains closed as the fear takes hold this week. It's Halloween - so what better week to discuss fear in board games? Today, Friday November 3rd 2017, we face our fears and talk about both what makes a scary game in general, and what scares us. Euro vs. Amerithrash, Part 1 - What is a Euro game? This week, we look at gaming's greatest line in the sand, as the SnakesCast examines the difference between Euro and Amerithrash games. We begin by asking: what defines a Euro game? 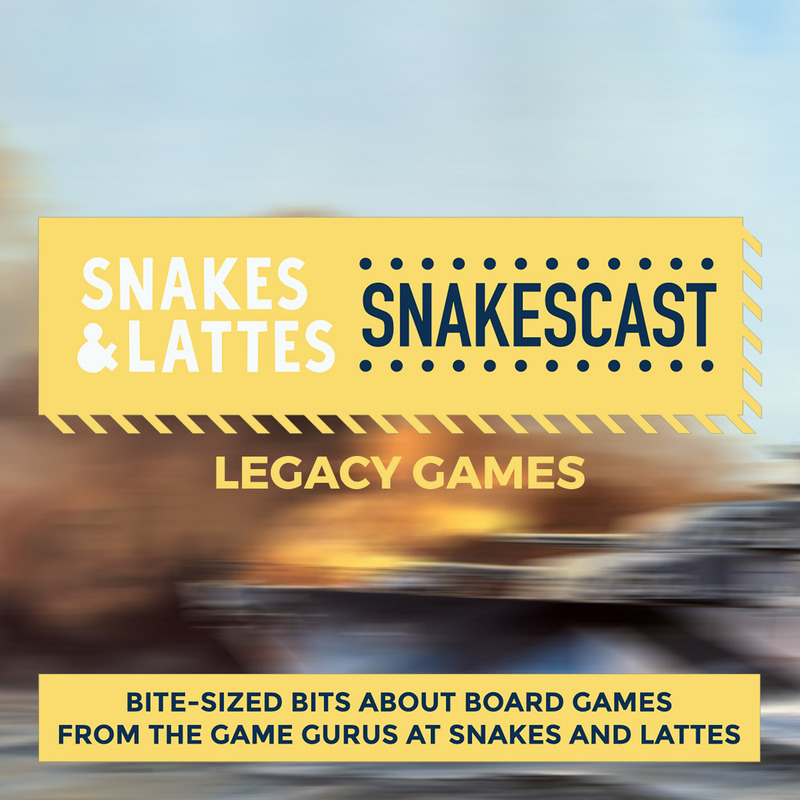 This week, we look at board gaming's greatest line in the sand, as the SnakesCast examines the difference between Euro and Amerithrash games. Today, Monday October 16th 2017, we begin this discussion with a definition as we ask the question: what defines a Euro, or European-style game? This week, we look at gaming's greatest line in the sand, as the SnakesCast examines the difference between Euro and Amerithrash games. Today we check out the other side of the coin by defining Amerithrash games. 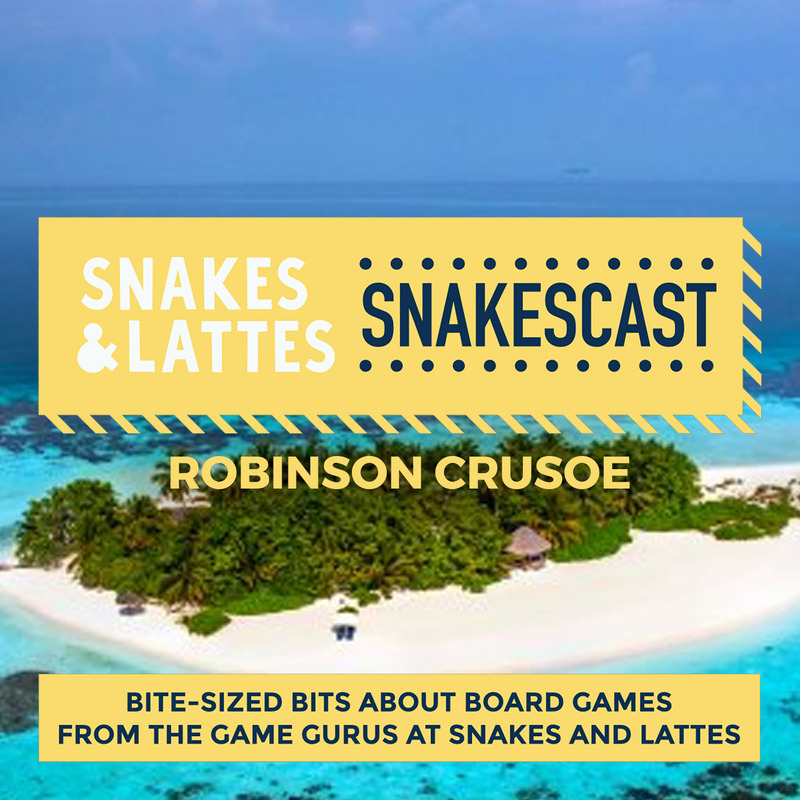 This week, we look at board gaming's greatest line in the sand, as the SnakesCast examines the difference between Euro and Amerithrash games. Today, Wednesday October 18th 2017, we check out the other side of the coin and define Amerithrash games - also known as American-style games. This week, we look at gaming's greatest line in the sand, as the SnakesCast examines the difference between Euro and Amerithrash games. We finish up by looking at the closer differences, and how contemporary hybrid games have come about. 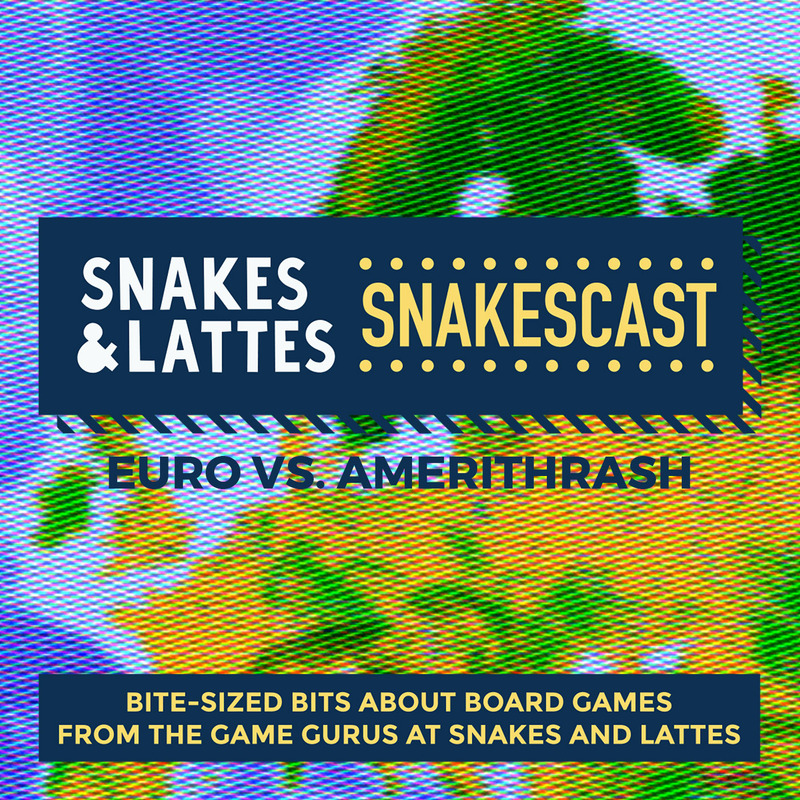 This week, we look at board gaming's greatest line in the sand, as the SnakesCast examines the difference between Euro and Amerithrash games. Today, Friday October 20th 2017, we finish up the discussion by looking at some of the grey areas and closer differences between the two, and also examine how the contemporary trend of more hybrid-style games came about. With Fall upon us, it's time to take a final stroll through our garden - our Cottage Garden, that is. This week the SnakesCast looks at Uwe Rosenburg's latest game, beginning with a discussion about it and Patchwork. 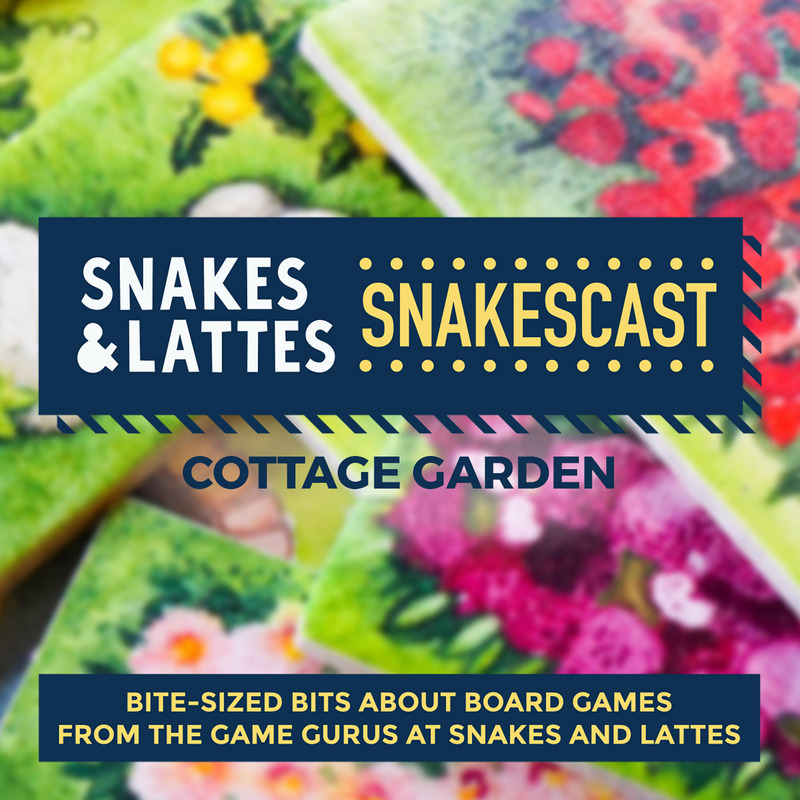 With Fall upon us, it's time to take a final stroll through our garden - our Cottage Garden, that is, and this week the SnakesCast examines Uwe Rosenburg's latest game. Today, Monday October 9th 2017, we begin by discussing the relationship between Cottage Garden and Patchwork, and some of the initial appeal of Cottage Garden - and there is a surprise thematic guest appearance this episode as well! Cottage Garden, Part 2 - Flower Pots, Cloches and More Cats! With Fall upon us, it's time to take a final stroll through our garden - our Cottage Garden, that is. This week the SnakesCast looks at Uwe Rosenburg's latest game, continuing with talk of completing flower beds and scoring points. With Fall upon us, it's time to take a final stroll through our garden - our Cottage Garden, that is, and this week the SnakesCast examines Uwe Rosenburg's latest game. Today, Wednesday October 11th 2017, we continue the discussion by talking about how you complete flower beds, and how points are scored - including some of the complexity involved, and how the visuals help to mitigate that. Cottage Garden, Part 3 - Challenges and Obstacles. And Cats. With Fall upon us, it's time to take a final stroll through our garden - our Cottage Garden, that is. This week the SnakesCast looks at Uwe Rosenburg's latest game, and we end up discussing challenges with it and Patchwork, and how we get around them. With Fall upon us, it's time to take a final stroll through our garden - our Cottage Garden, that is, and this week the SnakesCast examines Uwe Rosenburg's latest game. Today, Friday October 13th 2017, we end up by talking about some of the challenges and obstacles that create issues for both Cottage Garden and Patchwork, and how we get around them. We also briefly touch on Uwe Rosenburg's canon of games, including more complicated games with similar mechanisms. Trivia Games, Part 1 - What is the best-known trivia game? 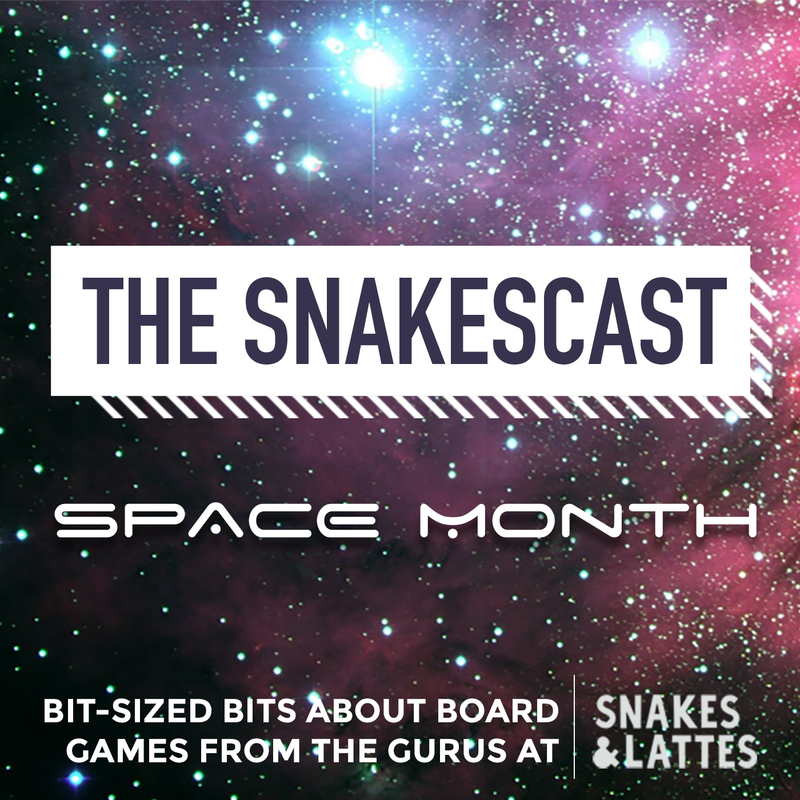 The SnakesCast asks questions this week, as we turn our attention to trivia games. Today, we look at one of the best-known games of all time - Trivial Pursuit. 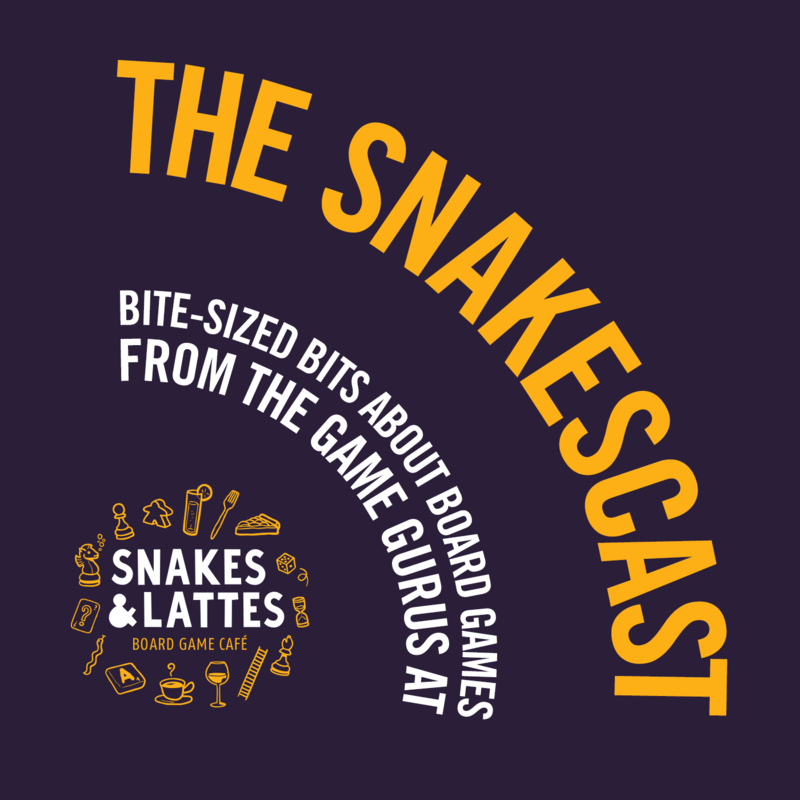 The SnakesCast asks questions this week - questions to which you may or may not know the answer, and may or may not need to know the answer - as we turn our attention to trivia games. Today, Monday September 25th 2017, we begin by looking at one of the best-known games of all time - Trivial Pursuit. The SnakesCast asks questions this week, as we turn our attention to trivia games. Today, we examine a couple of games that get around the issue of knowledge being a game-winning factor. 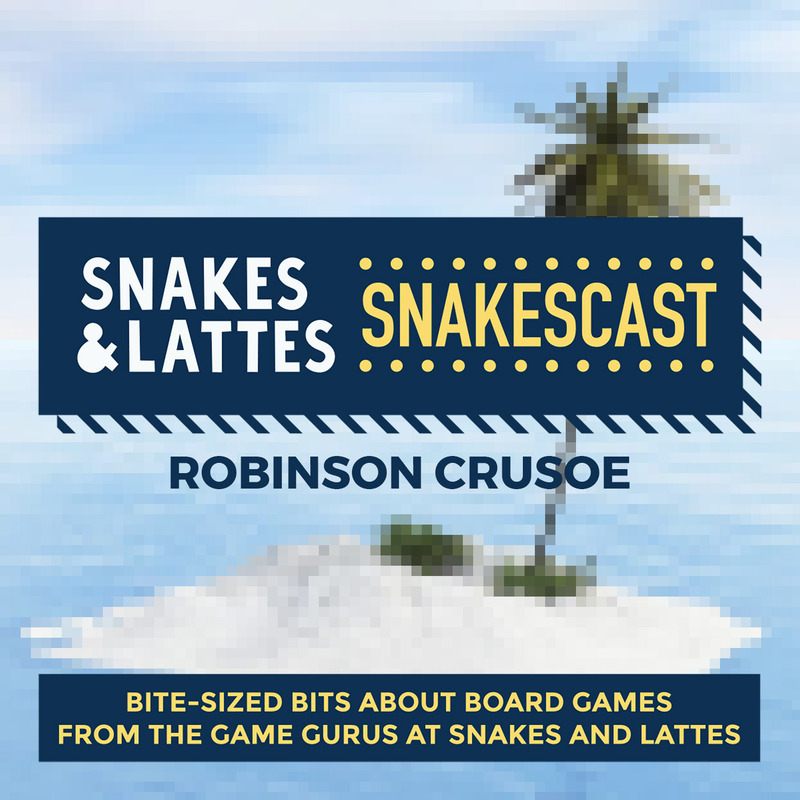 The SnakesCast asks questions this week - questions to which you may or may not know the answer, and may or may not need to know the answer - as we turn our attention to trivia games. Today, Wednesday September 27th 2017, we take a look at some games that get around the issue of having the most knowledgeable player win all the time. The SnakesCast asks questions this week, as we turn our attention to trivia games. Today's discussion looks at the wide variety of trivia games on offer, with everyone likely to find something that appeals. The SnakesCast asks questions this week - questions to which you may or may not know the answer, and may or may not need to know the answer - as we turn our attention to trivia games. Today, Friday September 29th 2017, we look at the wide variety of trivia games that are on offer - chances are you will find something here that appeals to you, even if you're not a big trivia game fan. How many players?, Part 1 - What do small player counts matter? 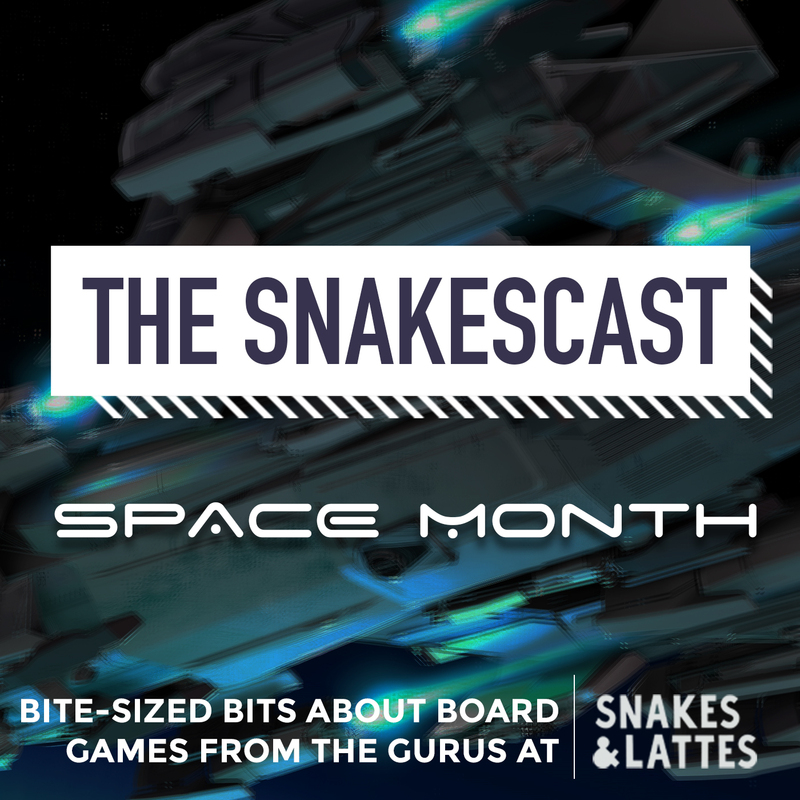 This week, the SnakesCast explores games for two players vs more players. We begin by asking why a two-player count is listed on some games. Are there just two of you, or are there more? Should you play the same game? We discuss those very questions this week on the SnakesCast. Today, Monday September 18th 2017, we begin by asking why a two-player count is listed on some games that really don't work well for two at all. How many players?, Part 2 - Why can't I play this with two players? 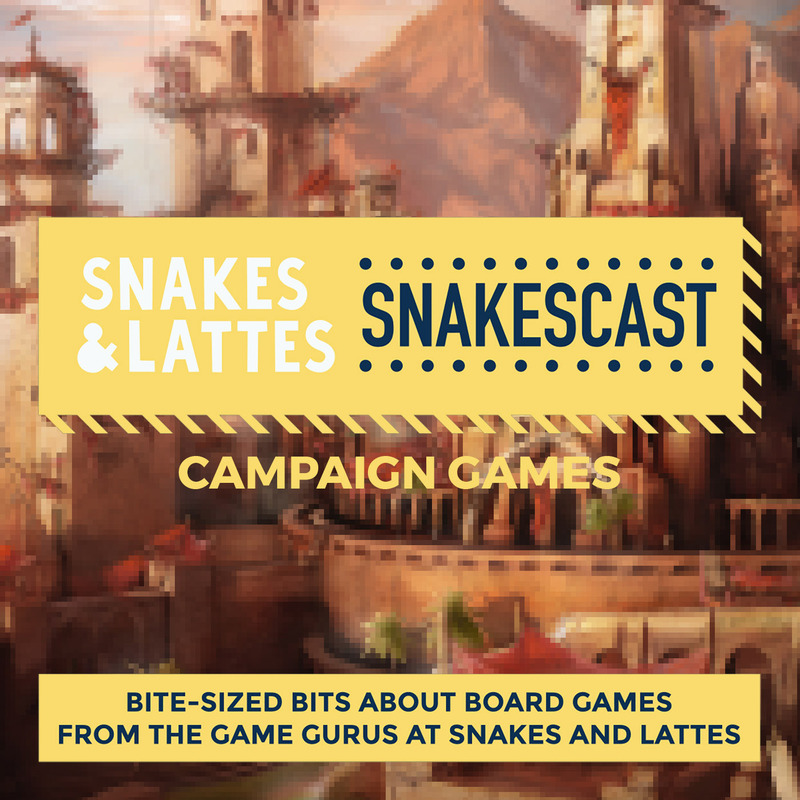 This week, the SnakesCast explores games for two players vs more players. Today, we look at games that may or may not offer two-player gameplay, but which do not play well with two regardless. Are there just two of you, or are there more? Should you play the same game? We discuss those very questions this week on the SnakesCast. Today, Wednesday September 20th 2017, we look at games that may or may not offer two-player gameplay, which people will try to play with two players, and which mostly do not work with only two people - and we talk a little bit about why that is as well. 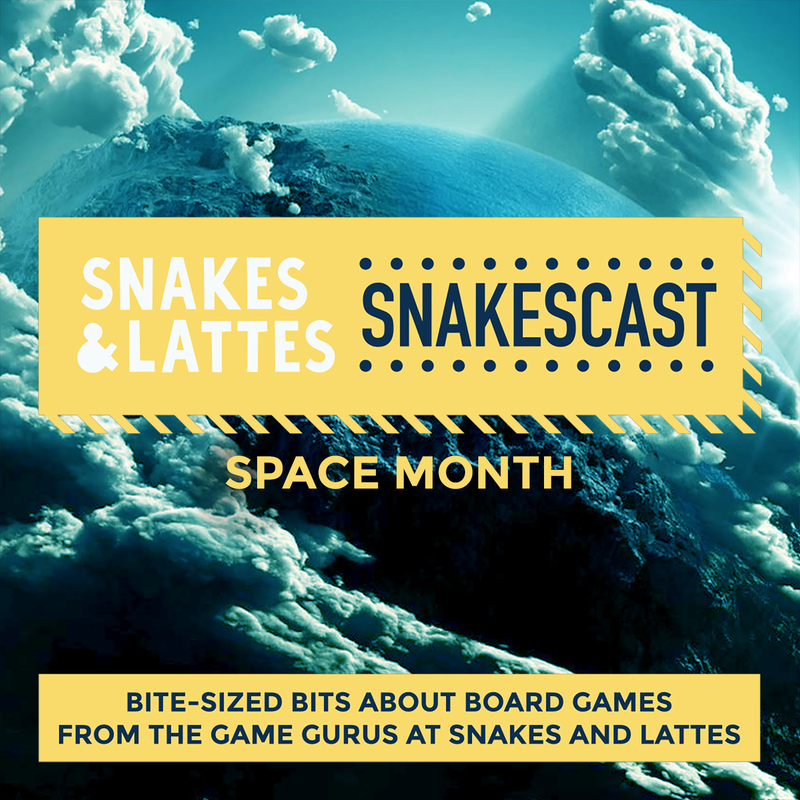 This week, the SnakesCast explores games for two players vs more players. We end up by discussing excellent two-player versions of games that are similar, but not the same. Are there just two of you, or are there more? Should you play the same game? We discuss those very questions this week on the SnakesCast. Today, Friday September 22nd 2017, we discuss two-player versions of games that take the core elements of the multiplayer game, extract them, and turn them into a version that works for two people. 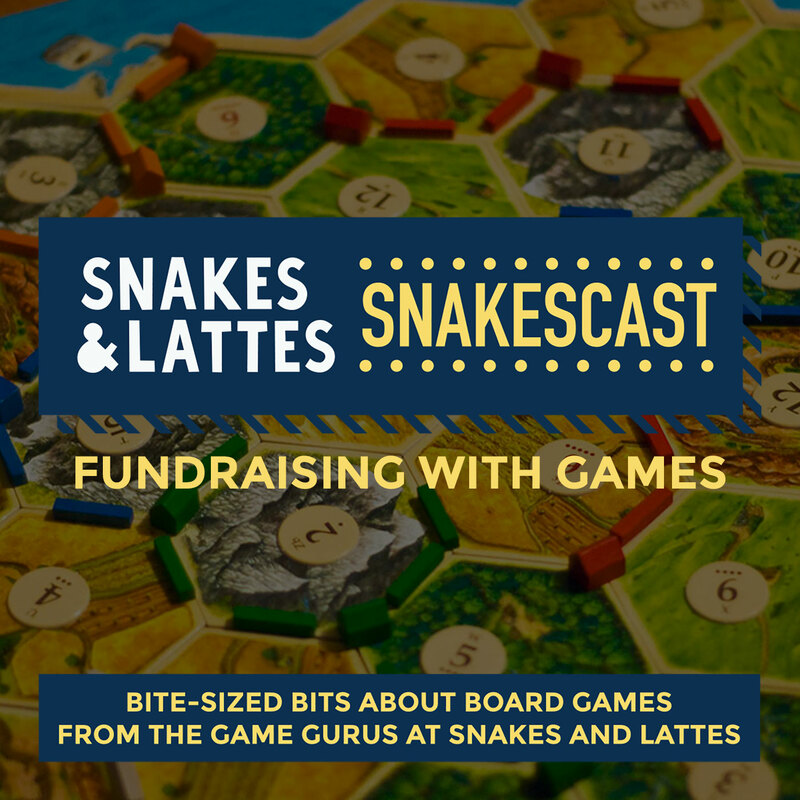 This week, we have a special episode series looking at fundraising with board games, and today we are looking ahead to the Snakes & Lattes Catan-a-thon Against Cancer! 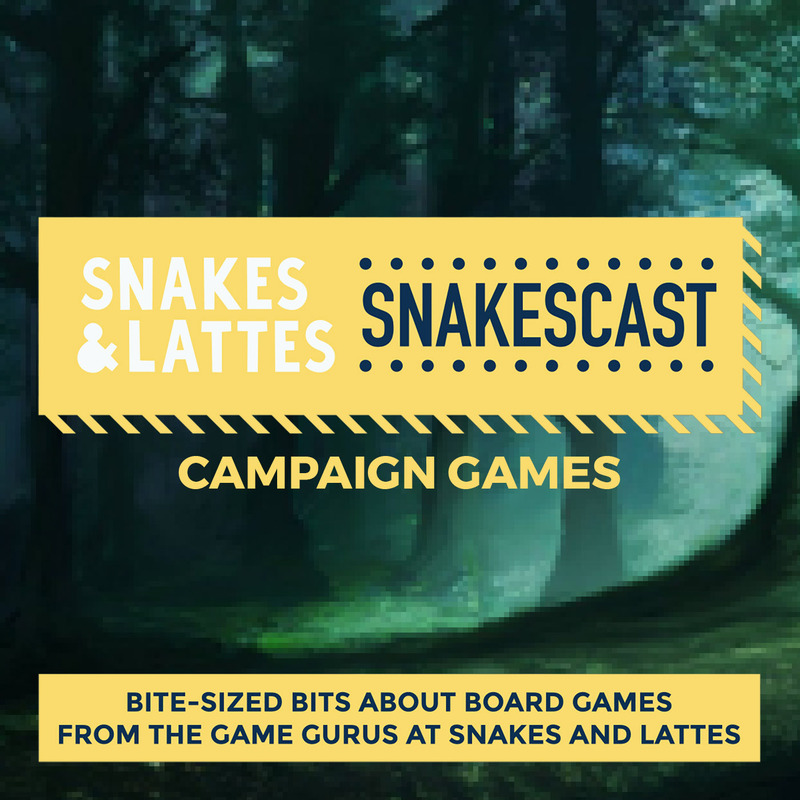 This week, the SnakesCast turns its attention to fundraising with board games, and some of the cool things that arise from that. Today, Monday September 11th 2017, we begin by looking ahead to the Snakes & Lattes Catan-a-thon Against Cancer, which will be taking place on Friday September 22nd from 7pm for as long as donations come in! This week, we have a special episode series looking at fundraising with board games, continuing with discussion of a couple of other fundraisers, and some of the ways we learned from them. 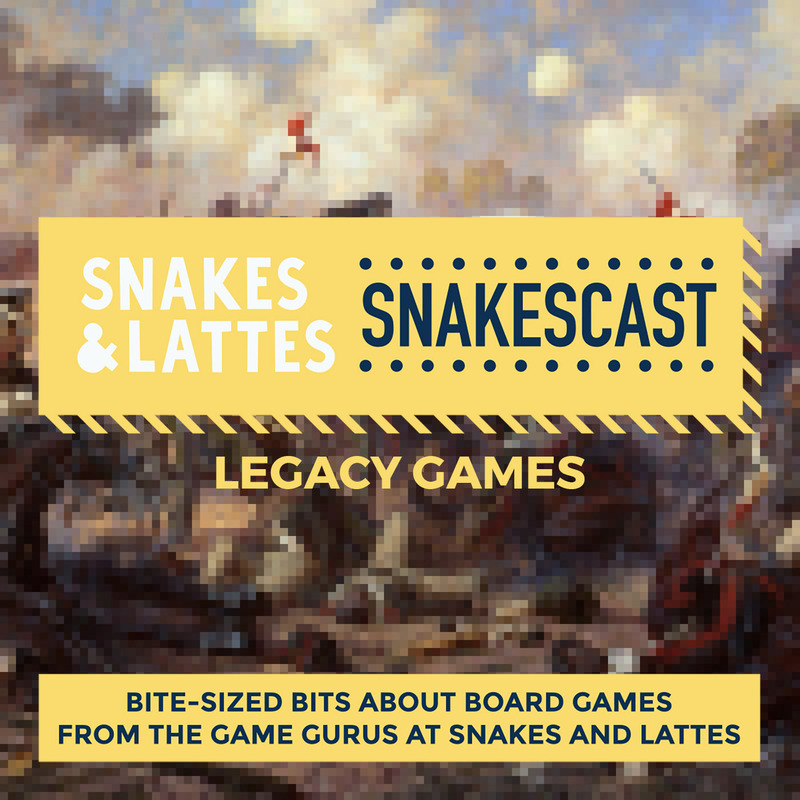 This week, the SnakesCast turns its attention to fundraising with board games, and some of the cool things that arise from that. Today, Wednesday September 13th 2017, we continue by looking at a couple of other fundraisers that use games, and also discuss how the Catan-a-thon has evolved as we learned from them. Fundraising with games, Part 3 - Catan, guests and wasabi - oh my! This week, we have a special episode series looking at fundraising with board games, and we finish up with a quick Catan overview, and talking about the guests we have coming in, and what wasabi has to do with all this. 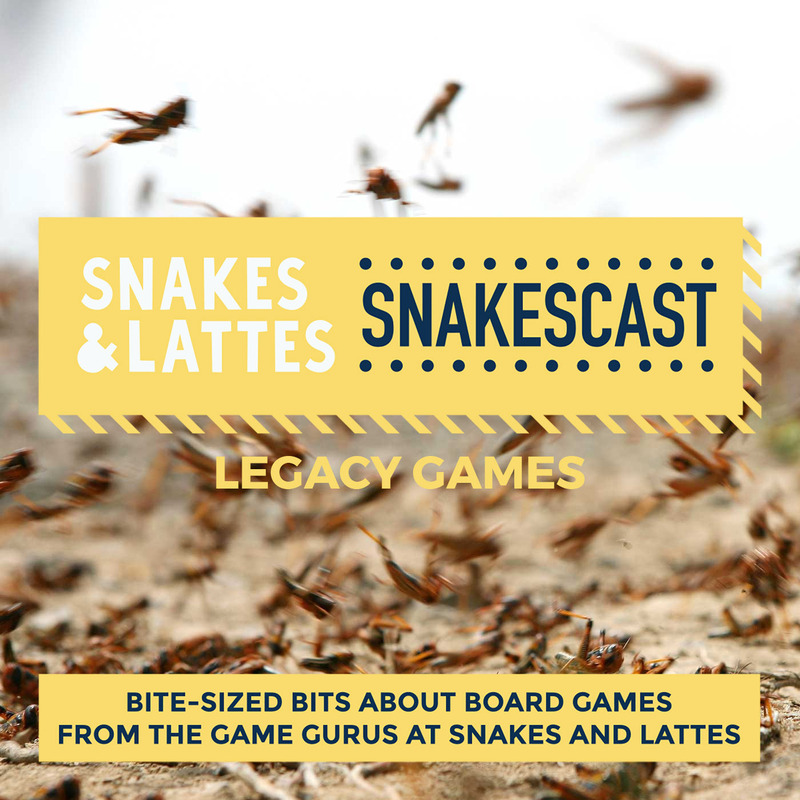 This week, the SnakesCast turns its attention to fundraising with board games, and some of the cool things that arise from that. Today, Friday September 15th 2017, we finish up first by giving a quick overview of the gameplay of Catan, and then discussing the guests who are going to join us for the Catan-a-thon, and also why wasabi is involved. It's Space Month week 4! This week we're on red alert - everything is going horribly wrong. Today we begin by discussing why space-based schadenfreude is so enjoyable, and talk about a great game about stuff going wrong in space for kids and adults alike. Welcome to week 4 of Space Month! This week we're on red alert as the toaster has caught fire, the computer is trying to work out how to make tea, and there's a very big alien spaceship outside the front door - stuff is going wrong in space. Today, Monday September 4th 2017, we begin with something going wrong right here on earth, and then start the discussion by looking at a great example of a game with this theme for kids and adults alike. Space Month: Stuff Goes Wrong in Space, Part 2 - She can't take much more of this! It's Space Month week 4! This week we're on red alert - everything is going horribly wrong. In today's discussion, our ships are breaking apart - can we save them, or at least ourselves? Welcome to week 4 of Space Month! This week we're on red alert as the toaster has caught fire, the computer is trying to work out how to make tea, and there's a very big alien spaceship outside the front door - stuff is going wrong in space. Today, Wednesday September 6th 2017, we discuss games where your spaceship isn't doing so well - in fact, it's breaking apart. Can we save the ship, or at least ourselves? Also, the theme of stuff going wrong on Earth continues, as a little audio was lost between the end of our discussion of Space Cadets and the beginning of Galaxy Trucker - just a wind up and introduction, so none of the real discussion is missing. It's Space Month week 4! This week we're on red alert - everything is going horribly wrong. We end with some of the tenses games set in space that we can think of! Welcome to week 4 of Space Month! This week we're on red alert as the toaster has caught fire, the computer is trying to work out how to make tea, and there's a very big alien spaceship outside the front door - stuff is going wrong in space. Today, Friday September 8th 2017, we look at some of the tensest games we know of that are set in space. If you thought things were going wrong before, buckle your seat belts... if they still work. It's Space Month week 3! This week, we uncover the secrets space has to hold as we look at games that explore space or focus on a specific planet, beginning today with the exploration games. Welcome to week 3 of Space Month! This week, we uncover the secrets space has to hold as we look at games that find you exploring either space itself or a specific planet. Today, Monday August 28th 2017, we begin by discussing those games that see you searching space for whatever you can find. It's Space Month week 3! This week, we uncover the secrets space has to hold as we look at games that explore space or focus on a specific planet, and today we land on a few planets to see what is there. Welcome to week 3 of Space Month! This week, we uncover the secrets space has to hold as we look at games that find you exploring either space itself or a specific planet. Today, Wednesday August 30th 2017, we look at a few of the games that are set on specific alien worlds, including one that is very close to home. It's Space Month week 3! This week, we uncover the secrets space has to hold as we look at games that explore space or focus on a specific planet, and we end up at our most specific, looking at games that take place on Mars. Welcome to week 3 of Space Month! This week, we uncover the secrets space has to hold as we look at games that find you exploring either space itself or a specific planet. Today, Friday September 1st 2017, we land on one specific planet - the red planet, and our most likely first landing as a species - Mars. It's Space Month week 2! This week, we get warlike, as we discuss games of galactic conquest. We begin the week by talking about the biggest of them all: Twilight Imperium 3rd Edition. Welcome to week 2 of Space Month! We get warlike this week, as we turn to games with the theme and objective of galactic conquest! Today, Monday August 21st 2017, we begin by discussing the grandest of all of the galactic conquest games: Twilight Imperium 3rd Edition. This episode was recorded in advance of the announcement of Twilight Imperium 4th Edition by Fantasy Flight Games at GenCon. Space Month: Galactic Conquest, Part 2 - War or diplomacy? It's Space Month week 2! This week, we get warlike, as we discuss games of galactic conquest. Today, war is optional, as you can negotiate your way to victory in Cosmic Encounter. Welcome to week 2 of Space Month! We get warlike this week, as we turn to games with the theme and objective of galactic conquest! Today, Wednesday August 23rd 2017, we turn our attention to a game where negotiation is as viable as war and table-talk is essential: Cosmic Encounter. It's Space Month week 2! This week, we get warlike, as we discuss games of galactic conquest. We end this week by talking about just a few more of the other fantastic conquest games set in space. Welcome to week 2 of Space Month! We get warlike this week, as we turn to games with the theme and objective of galactic conquest! Today, Friday August 25th 2017, we end up the week by taking a look at just a few more of the plethora of amazing space conquest games that are available. It's Space Month week 1! This week we discuss franchise games based in space, beginning with games set in the Star Wars universe. Welcome to week 1 of Space Month! This week we are going to be looking at franchise games that are set in space. Today, Monday August 14th 2017, we begin by travelling to a galaxy far, far away, and discussing some of the many games that are set in the Star Wars universe. It's Space Month week 1! This week we discuss franchise games based in space, continuing with games based on the Star Trek franchise. Welcome to week 1 of Space Month! This week we are going to be looking at franchise games that are set in space. Today, Wednesday August 16th 2017, we head to the final frontier in order to discuss some of the myriad games that are based on the various Star Trek series. It's Space Month week 1! This week we discuss franchise games based in space, and we're finishing with games from a variety of other amazing franchises. Welcome to week 1 of Space Month! This week we are going to be looking at franchise games that are set in space. Today, Friday August 18th 2017, we are going to finish the conversation by discussing a variety of games based upon some of the other fantastic space franchises that are out there. Visual-spatial games, Part 1 - What do we mean by visual-spatial? Looking closely at your options is important this week as we look at visual-spatial games, particularly for 2 players. We begin by talking about our definition of a visual-spatial game, and discussing examples. Looking closely at your options is important this week as we look at visual-spatial games, particularly examining examples that work for two players. Today, Monday August 7th 2017, we begin by defining visual-spatial games as we mean to discuss them, and talking about some accessible examples of such games. Looking closely at your options is important this week as we look at visual-spatial games, particularly for 2 players. Today we look at more such games, seeing how they evolved from our initial examples. Looking closely at your options is important this week as we look at visual-spatial games, particularly examining examples that work for two players. Today, Wednesday August 9th 2017, we look at some more examples of these games that are a little more involved than those we looked at on Monday. Looking closely at your options is important this week as we look at visual-spatial games, particularly for 2 players. Today we finish up this discussion by looking at some of our favourites. Looking closely at your options is important this week as we look at visual-spatial games, particularly examining examples that work for two players. Today, Friday August 11th 2017, we finish up this discussion by looking at some of our favourite games that fit this description. Have you ever wondered how best to teach your friends a new game? 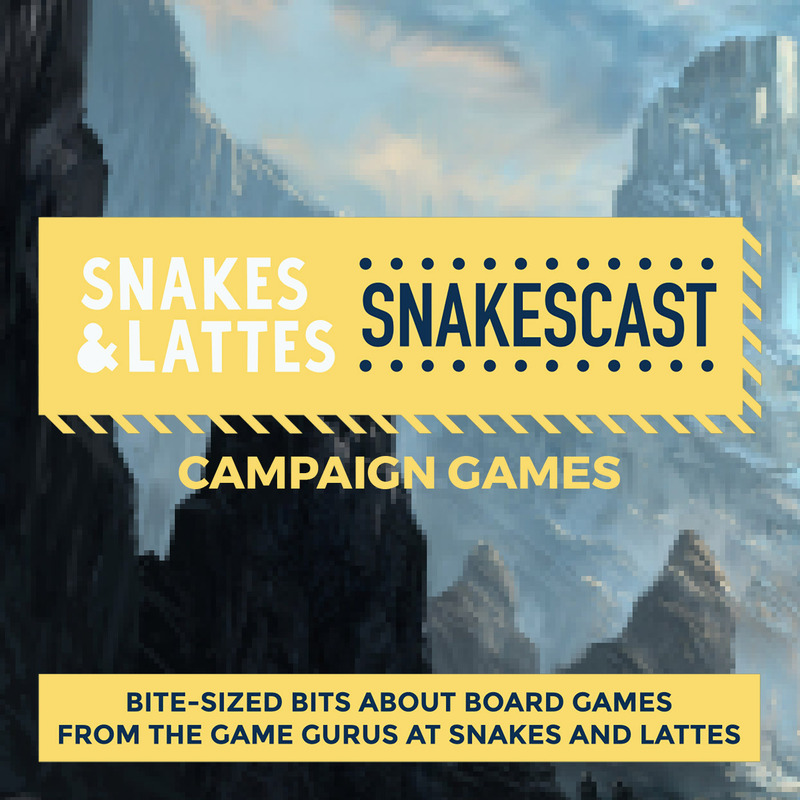 The SnakesCast team discusses methods of teaching games this week, beginning with the pre-preparation that is necessary before the game even hits the table. Have you ever wondered how best to teach your friends a new game, or whether the game is right for them? The SnakesCast team discusses teaching methods this week. Today, Monday July 31st 2017, we begin by talking about the things you need to do or ask yourself before the game even hits the table. Have you ever wondered how best to teach your friends a new game, or whether the game is right for them? The SnakesCast team discusses teaching methods this week. Today, Wednesday August 02 2017, we bring the box to the table, and suggest approaches to use when teaching games. Have you ever wondered how best to teach your friends a new game, or whether the game is right for them? The SnakesCast team discusses teaching methods this week. Today, Friday August 04 2017, we look at some of the obstacles that you might face during a teach, and how to approach them. Deception: Murder in Hong Kong - Part 1 - What is Deception all about? A murder has been committed in Hong Kong, and someone at the table is the murderer! The SnakesCast examines Deception: Murder in Hong Kong this week, beginning with the basics of the gameplay. A murder has been committed in Hong Kong, and someone at the table is the murderer! Join us this week as we examine Deception: Murder in Hong Kong. Today, Monday July 24th 2017, we begin by looking at the basics of the gameplay, the components and the investigative elements of the game. A murder has been committed in Hong Kong, and someone at the table is the murderer! The SnakesCast examines Deception: Murder in Hong Kong this week, and today we discuss the games that share mechanisms with it. A murder has been committed in Hong Kong, and someone at the table is the murderer! Join us this week as we examine Deception: Murder in Hong Kong. Today, Wednesday July 26 2017, we examine the games mechanical DNA, discussing games that may have inspired it, and definitely have similar building blocks. A murder has been committed in Hong Kong, and someone at the table is the murderer! The SnakesCast examines Deception: Murder in Hong Kong this week, and today we talk about some of the game's flaws, and who will enjoy it. A murder has been committed in Hong Kong, and someone at the table is the murderer! Join us this week as we examine Deception: Murder in Hong Kong. Today, Friday July 28 2017, we talk about some of the things that we are not so keen about, our perceptions of imperfections in the game, and people who will or may not enjoy it, or be good people to play it with. You'll never see us pass by this week, as the SnakesCast explores games in which a player's movement is hidden in some way. However today, Monday July 10th 2017, we begin with a slight tangent as we discuss games where it is something to do with the movement - such as which piece is actually yours - is hidden, rather than the movement itself. You'll never see us pass by this week, as the SnakesCast explores games in which a player's movement is hidden in some way. Today, Wednesday July 12th 2017, we look at several accessible games in which one player's movement is mostly unknown to the other players, with their playing piece rarely appearing on the board. You'll never see us pass by this week, as the SnakesCast explores games in which a player's movement is hidden in some way. Today, Friday July 14th 2017, we talk about games that take the concept of hidden movement further, wrapping it into games with other mechanisms or greater detail, and we also discuss the appeal of the tension in these games.